Paid parental leave has gone mainstream. 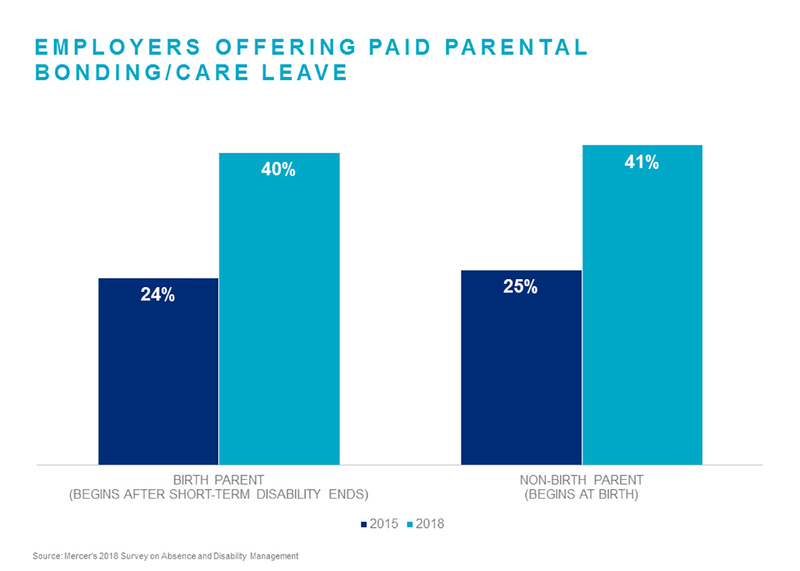 About two-fifths of survey respondents now offer paid parental leave for both the birth and non-birth parent, compared to only about a fourth of respondents in our 2015 survey. But while more employers are offering parental leave, the median number of weeks allowed remains unchanged. Read our previous blog post for more detail on how employers are implementing paid parental leave plans. Nearly a fifth of respondents offer paid leave for employees to care for a sick family member. In addition, 82% allow employees to use sick days to care for a sick family member or other non-health issue, up from 74% in 2015. While some of the change may be due to state or local mandates requiring such expansion, employers have recognized the growing need for time off for caregivers. Unlimited PTO may get a lot of press, but few employers have actually implemented it. Under an unlimited PTO policy, employees are permitted to use their discretion in taking time off from work, with no set number of days allowed. Just 3% of respondents offer unlimited PTO to all employees, and only 4% are considering it, although 9% are considering offering to executives or exempt employees only. Keeping up with the expanding number of state and local leave mandates is a serious challenge for many employers. Nearly two-thirds of respondents (64%) say that they have had to add resources to deal with new leave mandates. Our blog post on how employers are approaching state and local leaves provides more detail. The survey shows steady increases in employers who outsource leave administration, across employers of all sizes. The combination of expanding employer leave policies with the increasingly complex regulatory landscape has driven more employers to seek external help in administering these programs. Despite the growth in outsourcing, “improving FMLA administration” remains the top concern for employers as the usage of leave – continuous and intermittent, as well as ADAAA accommodation requests – continues to increase. Nearly half of respondents (47%) say this is a priority for their absence programs, followed by “measuring/reducing the impact of absence on operations” (36%). Mercer’s 2018 Survey on Absence and Disability Management was fielded March-April and 423 employers participated. The survey covered absence management strategies, paid-time off plans, leave administration, and disability plans. The complete report on the findings, which includes 40 data tables with results for most questions broken out by employer size and industry, is available for purchase. Contact rich.fuerstenberg@mercer.com if you have questions. Rich Fuerstenberg is a Senior Partner and is a senior consultant in Mercer’s Life, Absence and Disability (LAD) national specialty practice. In addition, Rich is a member of Mercer’s Center for Health Innovation, focusing on innovation in ancillary benefits like life, disability, dental, vision and voluntary benefits. A consultant with Mercer for more than 20 years, Rich works with employers across the country on the design, evaluation, and ongoing management of their health and group benefit plans, with special expertise in understanding the intersection of health, absence and employee productivity. Rich is a Fellow in the Society of Actuaries, a Member of the American Academy of Actuaries and a Fellow in the Conference of Consulting Actuaries. Are You Investing in the Right Well-Being Initiatives? Will You Be the Last Kid on the Block to Add Paid Parental Leave?